For the last 2 months, I've had the pleasure of being one of Chelsea's sponsors. She is such a sweetheart & I'm so glad to have her as today's featured nurse! Meet Chelsea from Big, Beautiful, & Broke! I graduated from nursing school in 2006, with an associates degree. I was a nerd in high school and researched all the nursing schools in Michigan in order to find the one with the smallest waiting list. So, I graduated fairly young, having just turned 21. I worked in ICU for 1 year, cardiac progressive care for 1 year and finally found my home in the ER where I've been for 5 years. I graduated last December with my BSN and am currently in graduate school to obtain a degree in nursing education. I had a hard time transitioning from student nurse to nurse, perhaps because I was so young and more than likely because I had NO healthcare experience prior to nursing school. It is hard to see "the whole picture" when you are a new nurse. I found that I was very task oriented and didn't necessarily put together why certain interventions were ordered and why. Also, going from working under another nurse's license as a student and taking on all the legal responsibility yourself is intimidating! I work in emergency care, so everyday is different! I have to hold knowledge of how to care for people of all ages and with all kinds of complaints...cardiac, respiratory, OB/GYN, pediatrics...you name it, I have to know how to treat it! It can be interesting somedays, as even after 5 years I still see new things. For instance, recently, a woman gave birth in our lobby toilet. That's one thing we don't like to deal with...babies being born in the ER! Women over 20 weeks typically get zoomed over to OB very quickly! We also have to hold more certifications than most areas. I have a CEN, BLS, ACLS, TNCC (trauma), ENPC (emergeny peds), DIMS (telemetry interpretation), and NIH stroke scale certified. I love being there for patients and the families of patients in their time of need. It is very rewarding to help people who are sick, teach them about their illness and provide support to them. My least favorite is dealing with those who abuse the system. I still provide them with the best care I can, but it can be frustrating having the same patients on a daily basis come in and demand drugs. My grandma was very sick when I was young and I remember seeing amazing nurses and terrible nurses. 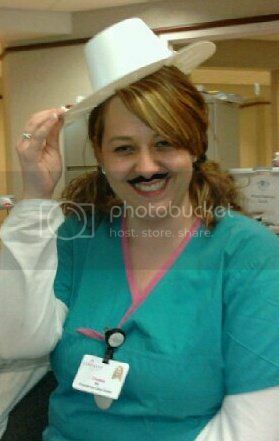 I respected the amazing nurses so much that I wanted to become one when I grew up! So in high school, I was very interested in medicine. At first, I wanted to be a doctor. However, after researching it, I found that doctors were not at the bedside as much as nurses and I wanted to be more hands-on with patients. I hated nursing school. I am not going to lie, the stress I felt for two years was hard. I had professors that were terrible and a couple of clinical instructors that had no interest in teaching. I was very young so I didn't connect with most of the other students, most of whom were older, married and had kids. The NCLEX. Oh, the dreaded NCLEX. The NCLEX is very intimidating. However, if you study, you will do fine. The practice books give you questions that are nothing like the questions you will see on the NCLEX, HOWEVER read the rationale behind the answers. That will really help you pass the test. I love starting IVs. I do so many IVs on a daily basis, that I could probably start an IV on a rock. I also love reading EKGs. 1. Take care of yourself, first and foremost. Get 8 hours of sleep, eat healthy, etc. You have to be healthy to care for other people. 2. Develop study habits that work for you. I used to make flash cards, therefore I was learning by writing and by reading. Find something that works for you and stick with it. 3. Relax! Take a night off once in awhile. Don't let the stress get to you. 4. Don't worry about your grades. Passing is passing, don't be hard on yourself if you don't graduate with straight A's. In reality, it doesn't matter. 5. Buy an NCLEX review book. It's never too early. It will help you with tests in nursing school too. 6. If you have a chance to work in healthcare in some capacity before or during nursing school, do it! Apply for externships, volunteer, or work as a nurses aide. I promise it will help you! 1. Don't settle in an area that you don't like. I started off in neuro and I hated it. I had no desire to learn and found myself dreading going to work. I quit after 3 months and found I was much happier in other areas. You might not land your dream job right off the bat, but that doesn't mean you have to dread going to work either. 2. If your preceptor isn't providing you with a positive learning environment, request a different one. Some personalities don't mesh, and you deserve someone who is willing to help you grow as a nurse, not belittle you. The saying nurses eat their young is true, but it doesn't have to be! 3. Don't be afraid to ask questions!!! For both nursing students and new grads: Be patient. Take the time to learn and gain experience. You will make mistakes. That is OKAY. Focus on the positive...every mistake will teach you something new. Learn from it and move forward. Build a good professional relationship with your co-workers and preceptors. Show initiative. And never stop learning! What have we learned here today, folks? If you have a problem, go see Chelsea. Girl is talented! And knows what she is talking about! 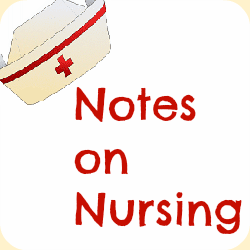 If you are a nurse or nursing student & want to be featured in Notes on Nursing, leave a comment below or e-mail me at friebr01@luther.edu! Gah I would love to be in a hospital! And in the ER! Wow tha would be awesome! You rock girl!